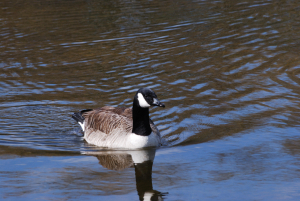 Observation - Canada Goose With Ring - UK and Ireland. Description: This is the male of a pair nesting on a small lake. Took me ages to find the female sitting tight in undergrowth on a small tree covered island; just about textbook. This is the male of a pair nesting on a small lake. Took me ages to find the female sitting tight in undergrowth on a small tree covered island; just about textbook.